Join Us For This One-Of-A-Kind-Run! This year marks the 7th Annual Run The Runway and our race promises to be even bigger and better than years past. Grab your friends and your sneakers to join us for a one-of-a-kind morning run to benefit Playworks Arizona and our mission to ensure safe and inclusive play for 55,000 students, every day! Participants will take in the beautiful views from the Scottsdale Airport runway then prepare for landing into our post-race festival that can’t be beat. 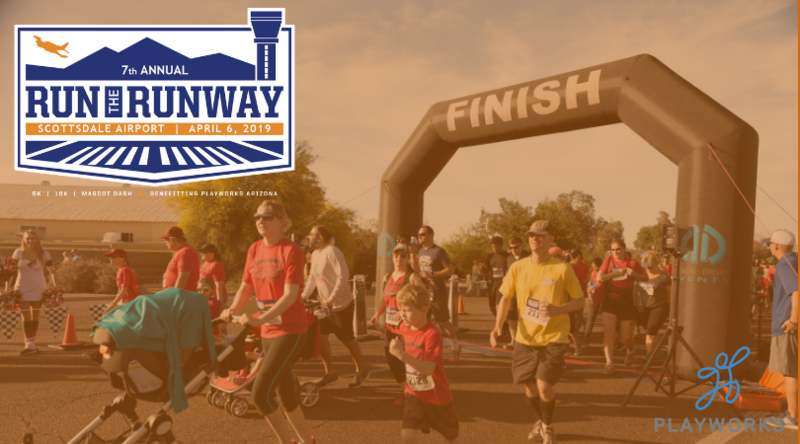 Create memories at our Run The Runway photo booth, collect samples and goodies from top-notch vendors, and sneak a selfie with the Arizona sports teams’ mascots. Whether you choose to run the 5K, 10K, or our famous Mascot Dash, your experience will be sure to be an unforgettable one!